I don't know if I'm just very impressionable, but I liked the first name suggestion I received: Adelaide. Plus it's a very Australian name, although not my part of it. Thanks to Bonita for that suggestion. Adelaide has made her way to Belgium, to visit Emma, of the blog Little Miss Bamboo. Although she is a wintery sort of hat, the downside of visiting in winter is that the days are short and the weather is unhelpful. Luckily, Emma managed to get some nice indoor shots with Adelaide. For more photos and Emma's write-up, visit her blog at Little Miss Bamboo. 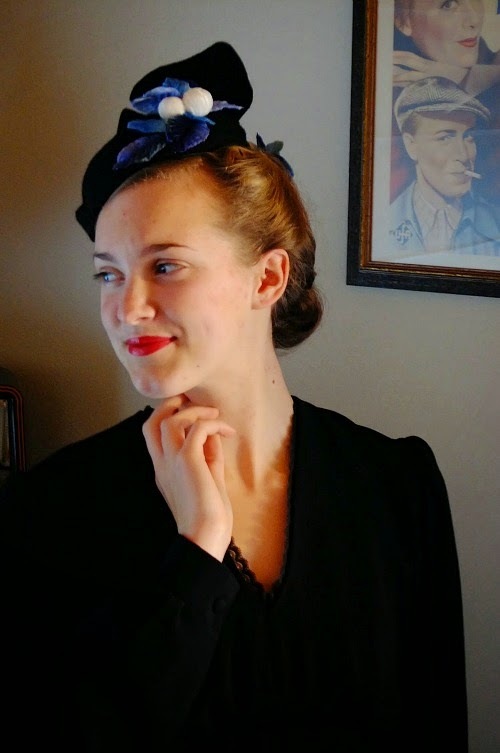 You can also see lots of photos from the cool WWII events that Emma frequently attends. There's a lot of jeeps. 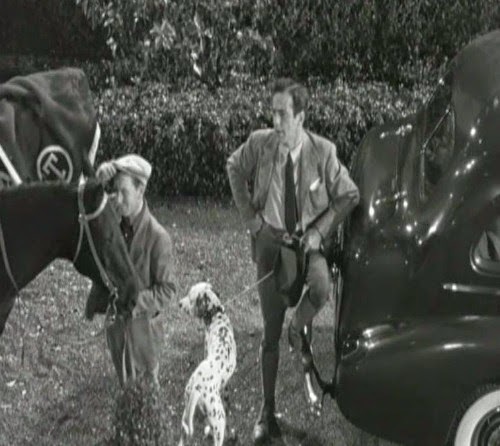 Today's movie is Dark Victory (1939). 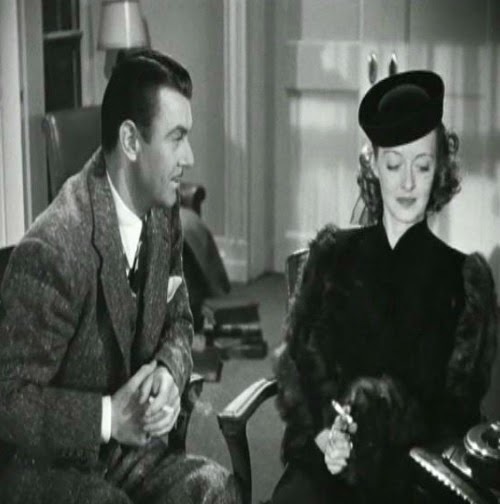 It centres around Judith Traherne (Bette Davis), her battle with a brain tumour, and her romance with her doctor (George Brent). 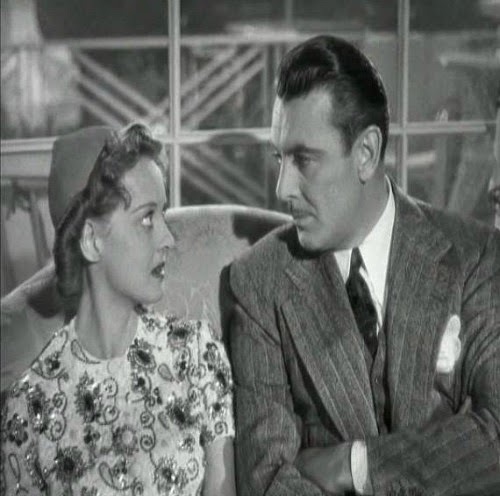 A headstrong and stubborn woman, Judith begins the movie well aware that she is struggling with some sort of illness, but refusing to tell her doctor, see a specialist, or change her lifestyle of late nights, partying and cigarettes (for which those who don't know better are blaming her headaches and dizzy spells). This isn't a movie of jaw-dropping hats. There are only a small number to look at, and most are practical and simple. Like The Bishop's Wife, however, the hats are significant. 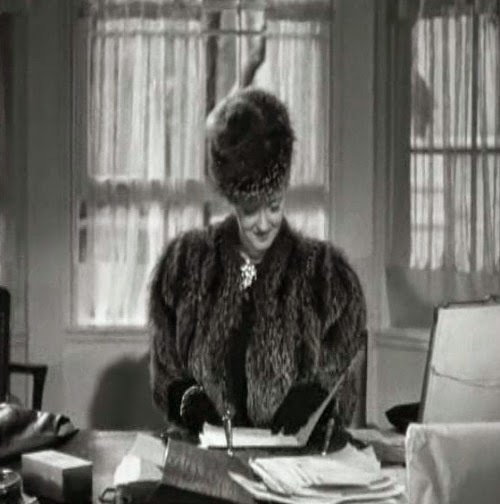 Bette Davis wears two styles of hat in this movie: dark tilt hats and lighter pixie hats. 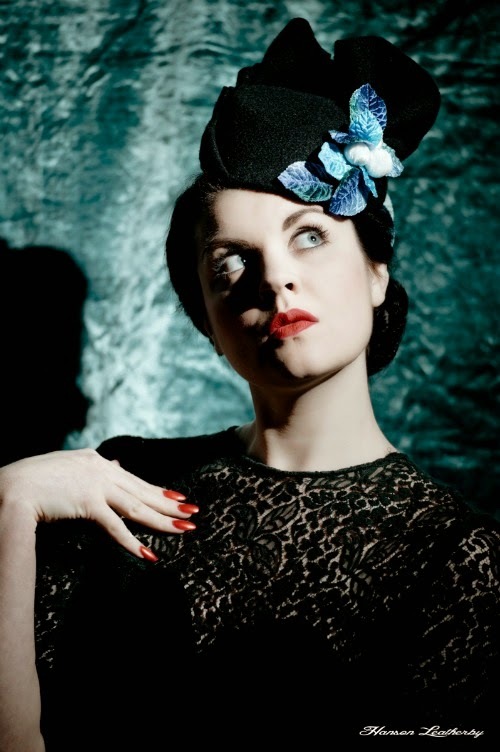 When she first visits Dr Steele, she is wearing a simple but very elegant dark felt tilt hat. 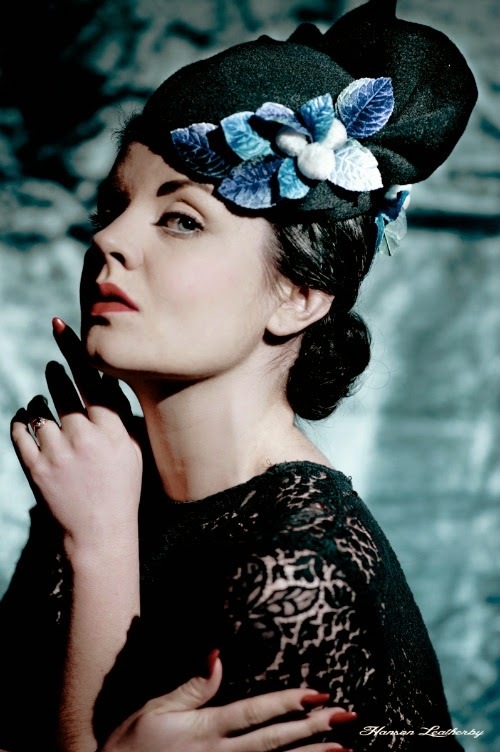 I love the way the very plain hat is set off by the large frothy bow at the back. After her operation, Judith has a cute little cap made specially to match her new outfit and cover the patch of cut hair. Before the operation she is upset about having to lose some hair. Afterwards, she just rejoices in the hats that cover it, and in her returned health. 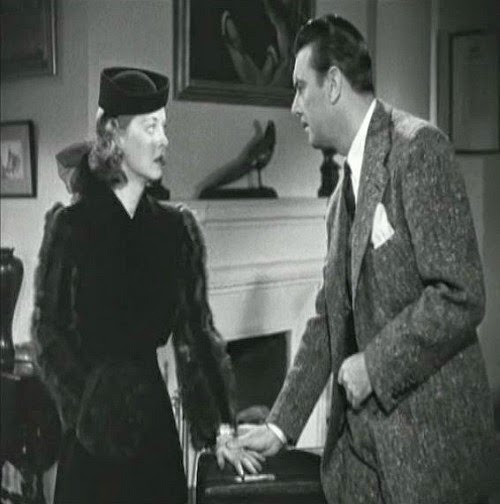 And in her fondness for Dr Steele. When her dark mood descends again, she's back in a tilt hat, this time in opulent fur. 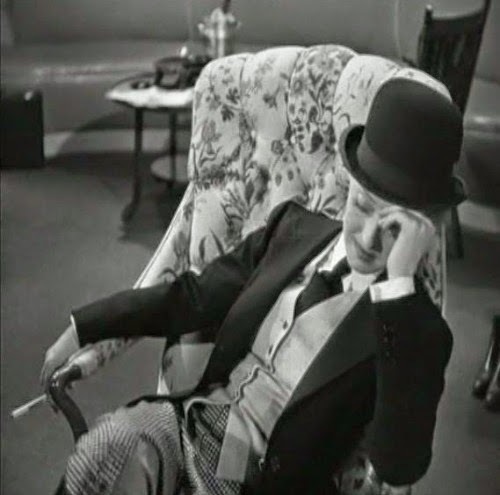 I don't think I've seen anyone look this stylish in a bowler hat. The straightforward correlation between happiness and hats doesn't quite continue though, because she's back in a white sequined pixie hat while her wild mood continues. She is still wearing it when she returns to the arms of Dr Steele, so perhaps we can say that it still works! 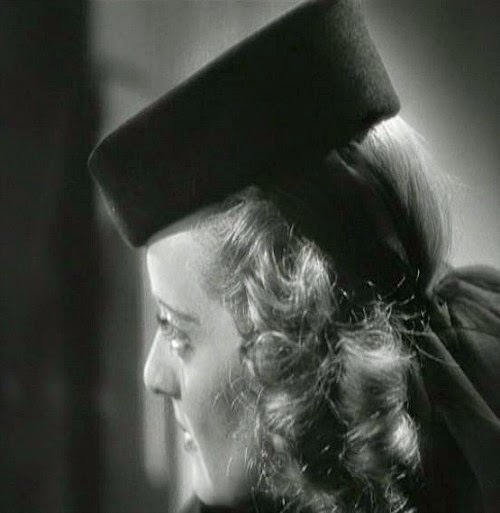 There are some cute hats on the supporting cast and extras too, but they feature quite briefly. I'll leave them to you to enjoy if you ever catch this movie. 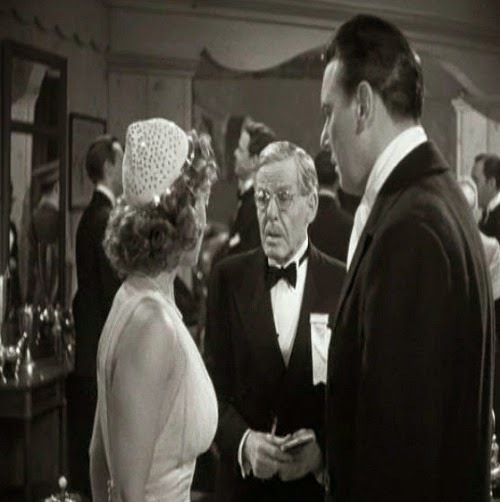 "Take your hat off when I'm talking to a lady." 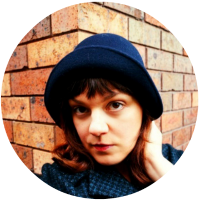 I'm so excited to share the first stop in the Sisterhood of the Travelling Hat. The hat set off just before Christmas on a very long trip to visit Jeni Yesterday, in England. Get ready to be wowed, people! 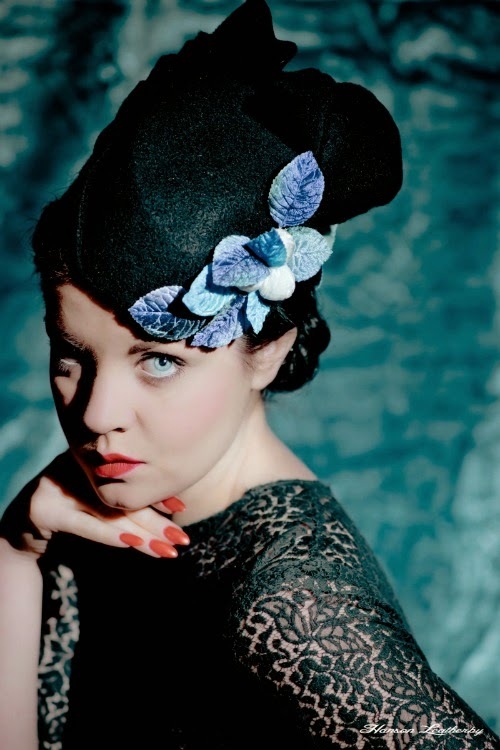 That's right, that's our little travelling hat there, looking so glamorous it's almost beyond belief! 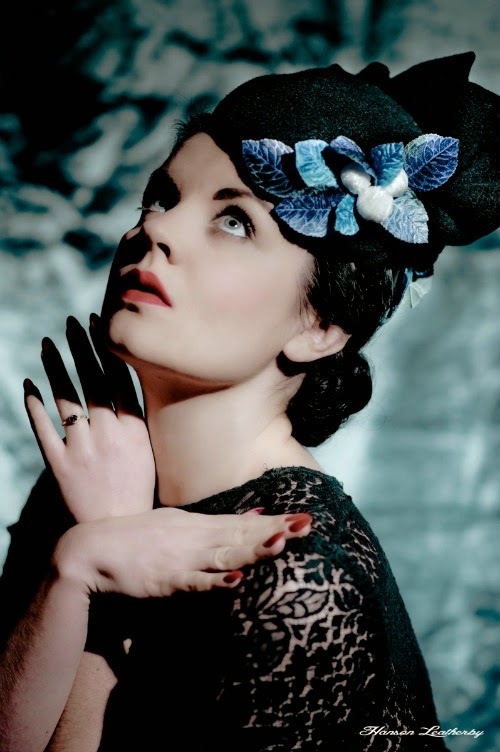 Jeni and her partner (and photographer) were inspired by an exhibition of the photography of Horst P. Horst at the Victoria and Albert Museum in London. Their aim was to create something like the Vogue covers from the 40s and 50s, and I think we can all agree they've done a stunning job. I don't know what I love most about these photos. The classic vintage style and model poses are just perfect, but I also love the colours - the pops of red among the dark moody shades - and the way the textures have shown up so vividly. I'm so glad I started this project. Every time the hat reaches a new destination, I'm going to be eagerly awaiting the images. 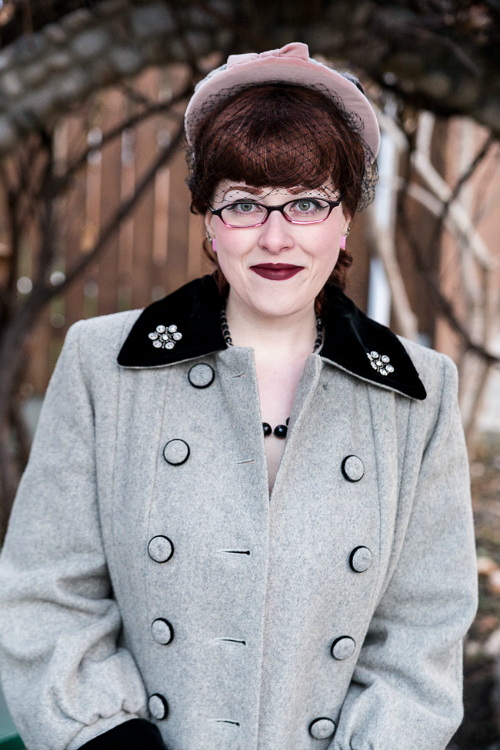 Thank you Jeni for being a part of the hat's journey! You can find Jeni on twitter and instagram. I also recommend taking a look around at Hanson Leatherby Photography on facebook or at their website. I really just got lost there in the photos. So good! Also, I think we need to name the hat. I'm sick of calling her "the hat" and having to decide whether to use "her" or "it". Any ideas? 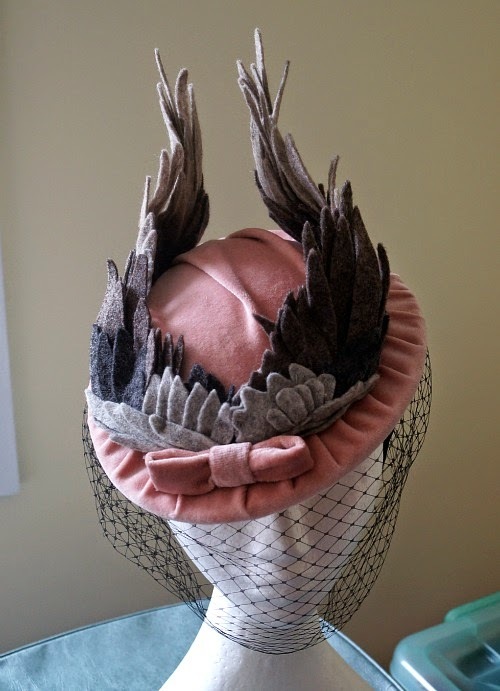 Today I'm sharing the story of a special hat I made for Jessica at Chronically Vintage. 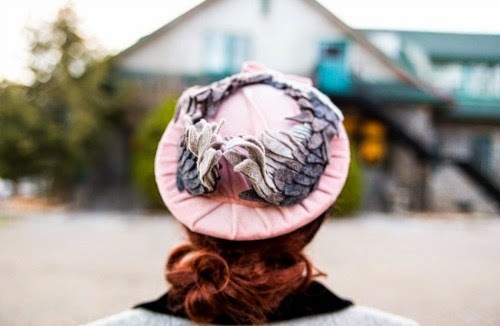 I know many of you follow Jessica's blog, and some of you are new here thanks to her post about this hat, but I do love to tell the stories behind my hats and a bit about their creation, so I hope you'll forgive the repetition. I found Jessica's wonderful and inspiring blog towards the end of 2013 and we exchanged comments back and forth. 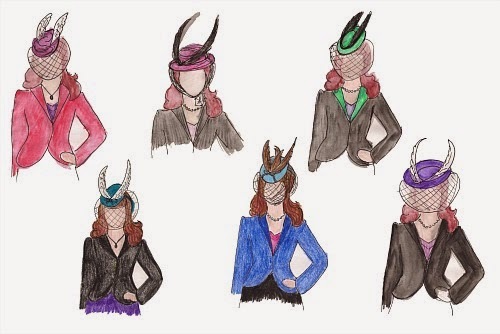 She is a hat lover and a dedicated hat wearer, showing how to wear a hat with style and so that it looks like a natural addition to an outfit. I offered to make her a hat, and although there were a number of delays (largely pregnancy-related), I am now able to share these amazing pictures of Jessica in her hat. Here are some of the sketches I sent Jessica along the way. 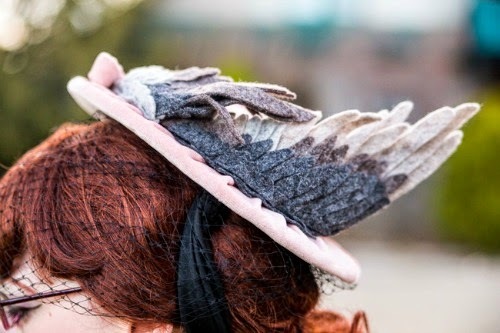 Since I'm not buying feathers anymore (although I am still using up the ones I have), we chose to explore other options. As well as suiting my ethical preferences, it became an opportunity to design the wings exactly as I wanted, in the colours we wanted, and also a fun creative adventure and challenge. 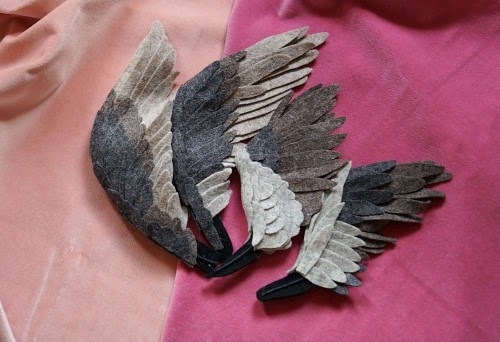 These wings are made from 100% merino wool felt. I spent a long time studying pictures of birds wings and diagrams of feather placement on wings, to get as close to a realistic look as I could. The wings are wired, allowing me to shape them as I needed while placing them on the hat. Plus, being felt, I was able to steam the individual feathers as I wanted too while doing the final styling of the trims. 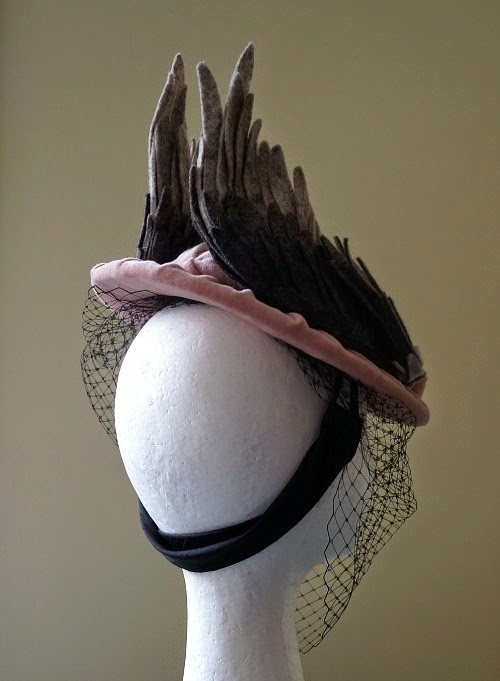 We chose to go for a brown/grey colour to the wings and a soft dusky pink for the hat. 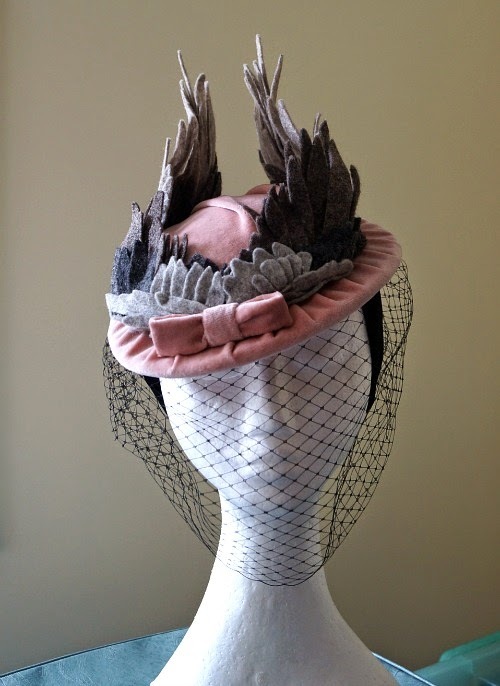 The fabric is a pink vintage velvet, gathered in gentle folds around the brim and crown. 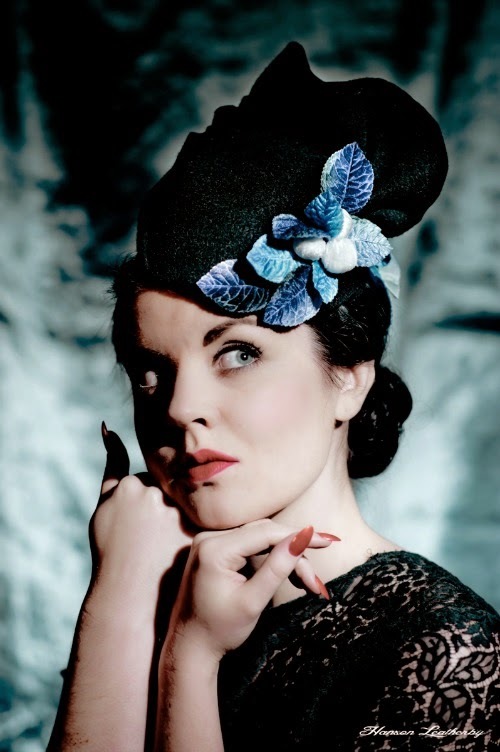 A classically flattering tilt hat shape, with a bandeau with elastic loops at the side to allow for a comfortable fit. This was a long process, but a fun hat to make. 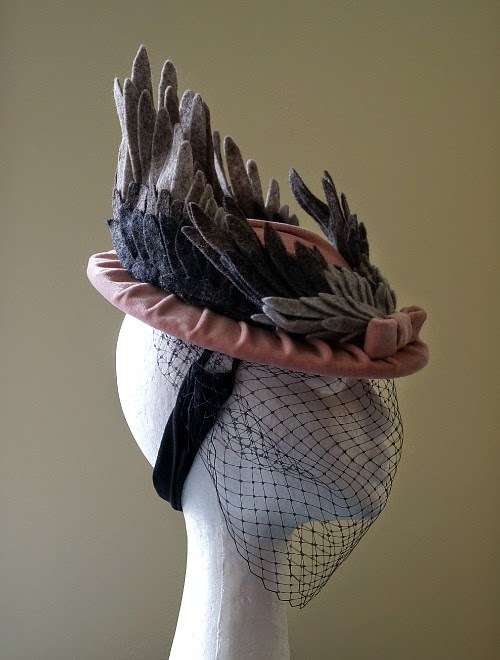 I think it is my favourite hat yet, and I'm so pleased to see how elegantly Jessica wears it. There is nothing quite like working together with someone to create something unique that they will love forever. 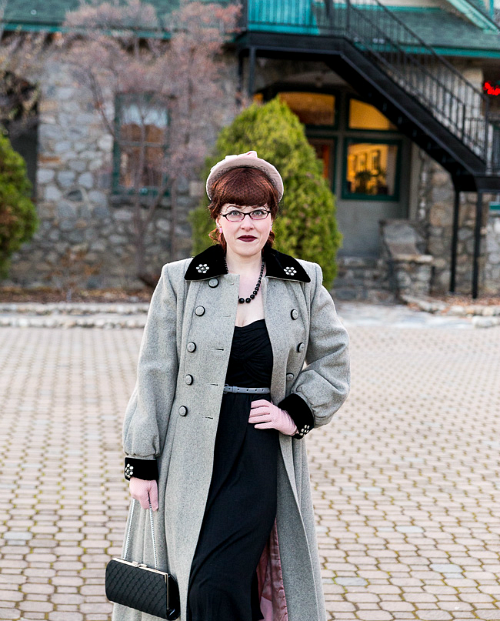 I strongly ecourage you to go over to Chronically Vintage and see the rest of the photos of Jessica. They are, and she is, truly stunning. 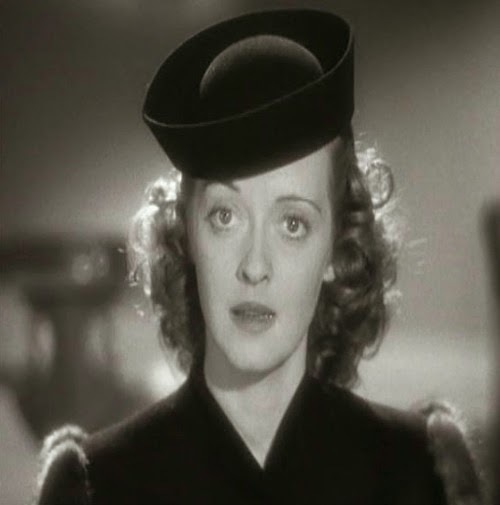 What style of hat do you adore, but never find available to buy?